The first thing I was asking myself what can be done to create the default Citrix Client smarter? The first thing that came up into mind was the configuration of settings is not logically available within the Citrix client. On the other side I hardly see users which are changing these settings. The first impression when I started the tool that the people behind Virtual Technologies are sharing this opinion with me because the Smart Citrix Client is mostly an advanced Citrix Client setting editor. As many freeware tools no installation steps are required. The tool exists of a single executable that can be place anywhere on the system. The Smart Citrix Client is actually a kind of add-on to the current Citrix ICA client, so this should be available as a prerequisite to use the Smart Citrix Client. When you start the Smart Citrix Client it has a bit of the Remote Desktop Connection style. You have a banner of Virtual Technologies, a box to select the desired Published Applications the type of network connection and a connect box. This is probably the way the client will be used and presented to the end-users. First I thought user will not like this concept, because the Citrix ICA client displays icons of all available applications, but after starting some applications via this way I was pretty used to it. The big strength of the Smart Citrix Client is the button Options, which displays (in a comparable display as the RDP client) all kind of Citrix client settings. Beside the settings which are available within the default Citrix ICA client, there are also some settings that cannot be configured out of the default client. Let's walk quickly through the tabs. User logon information (Pass Through, No User information or fill in the user credentials), creating a ICA file, save or restoring the settings (I could not find out where this information was stored). The type of Windows colors and the Windows size (seamless, resolution settings). Enable or Disable local devices like sound, drive, printers (even printer spooling) and the usage of Windows key combinations. The settings for the connection to the Citrix farms can be set here, like the servers to connect to reveal the Published Applications, network protocol, firewall settings, connection time outs and numbers. Like the name already explains the ICA cache settings as bitmap cache size and the minimum size of the bitmap to cache. Also a option to clear the current cache. Here several settings can be found which are not available in the Citrix ICA client. You can configure here the connection ports (also the ICA and Session Reliability ports), SpeedScreen settings, several compression, queue, timer and optimization settings. Here you can select the default program to start if directly connection to a server (not published as Desktop). 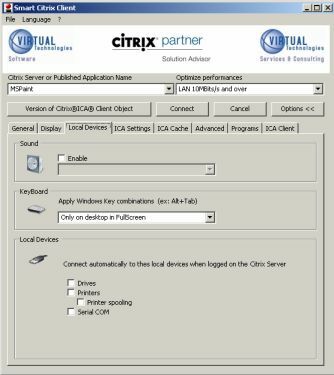 Configuration of the ICA client name, some information about the system the client is installed on and configuration of the Citrix Client log file (also not available on the Citrix ICA Client). Previous versions of this freeware tool were called Citrix Easy Connect Manager. Personally I would call the product Smart Citrix Client Configurator, because this is the big difference between the standard Citrix ICA client. Within the Smart Citrix Client several settings can be configured out of graphical interface which are not available in the Citrix client. But such kinds of settings are mostly only configured once by the administrator. For the end user the tool does not offer much additional functionality only the possibility to set the connection type easily. Besides the user should be get used to select the application in another way than in the PN client. But the biggest reason I think this client would not be give to end users is the banner of Virtual Technologies being displayed. Probably the tool would be used most by administrators to create a ICA file (now this option is not available any more in the CPS 4.5 Consoles and specific settings are added easily).